David operates out of SavATree’s Springfield, VA branch, providing comprehensive tree, shrub, lawn, tick and deer services to clients in Alexandria, VA. Some popular services offered to clients in the Alexandra, VA area include tree pruning and trimming, tree removal, tree and lawn disease management, tree and lawn fertilization, organic lawn care and tree care options, shrub services such as trimming and disease management, lawn seeding, lawn aeration, deer browsing prevention services including out effective DeerTech program and pest control such as mosquito and tick treatments. If you would like David to come out to your property and create a custom program to care for your trees and lawn, don’t hesitate to reach out! David has been working on landscapes for over 25 years. David earned his degree in Business Management & Finance from Towson State University. David is married and has two children: a teenager and a toddler. He lives in Burke, VA where he enjoys chess and running. What are David’s Customers Saying? April 20, 2019 – Black Knot Fungus affects Cherry, Plum, Apricot and Chokecherry trees in North America. The disease produces rough, black growths that encircle, girdle and kill the infested parts. Black knot occurs only on the woody parts of trees, primarily on twigs and branches, but can spread to larger limbs and even the trunk. A heavily infected plant can be incredibly ugly and are usually candidates for removal. Infected parts can be pruned out and fungicide applications may slow the progression of this disease. 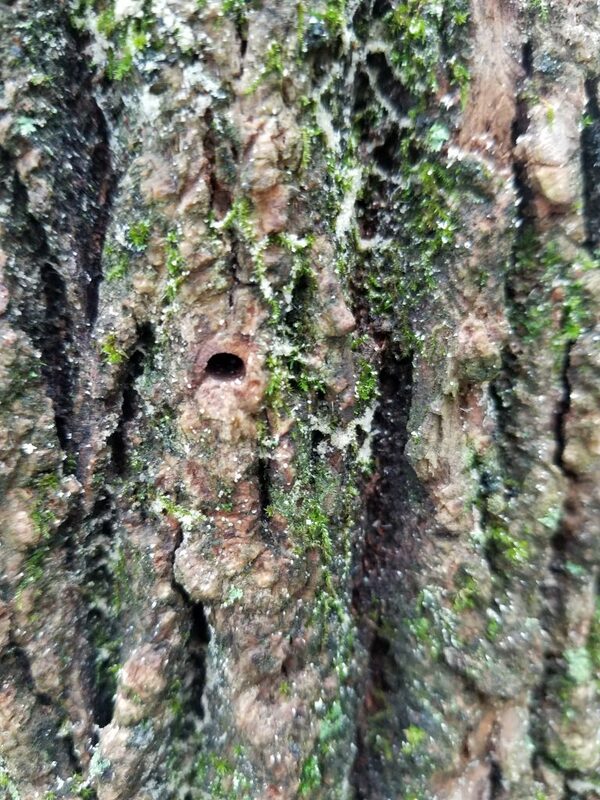 If your tree is showing signs of Black Knot Fungus, contact your local SavATree arborist! April 9, 2019 – Shot hole disease (also called Coryneum blight) is a serious fungal disease that creates BB-sized holes in leaves, rough areas on fruit, and concentric lesions on branches. Almost all above ground parts of the plants are affected including the fruits, buds and the stems, but the damage is most noticeable on the leaves. The symptoms begin with small (1/10-1/4”) reddish or purplish-brown spots with a light green or yellow ring around them. As the disease progresses, the damaged areas become slightly larger and then dry up and fall away, leaving small holes behind. As the fungus spreads, more leaf tissue is damaged until the leaf falls. Significant infections can reduce the amount of photosynthesis that can occur, weakening the plant and decreasing fruit production. The pathogen overwinters in infected buds and in twig cankers. Infection can occur any time moisture is present for at least 24 hours, as long as temperatures are above 36 °F. At higher temperatures, infection occurs more quickly. The pathogen can remain viable for several months and spores are often airborne. Since the fungi thrive in wet conditions, overhead watering should be avoided. Remove and dispose of any infected buds, leaves and fruit. Contact your SavATree Arborist for disease management! November 21, 2018 – This picture shows an Oak tree with bark staining and weeping from alcoholic flux. While there is no direct treatment for this, I usually recommend stress reduction measures with our ArborHealth fertilizer and our ArborKelp applications. I will also often recommend wood borer prevention applications to keep opportunistic insects away. November 20, 2018 – This picture shows the D-shaped exit hole and frass in the bark and crevices of the Emerald Ash Borer in an already compromised Ash tree. If the tree was still viable, I would recommend the tree injection with TreeAge. In this situation, the tree in question, unfortunately, needed to be removed. November 16, 2018 – This picture was taken in one of my clients’ backyards in Alexandria, Virginia. The picture is of diseased foliage from a Hornbeam. White this client does have a disease prevention program in place, it wasn’t sufficient enough for this year. Due to the excess rainfall throughout the summer months, we should have extended our Disease Control applications longer into the season. We have began three Disease – Deciduous treatments for this year and recommended the full program of five treatments for next year. November 16, 2018 – This photo shows a very invasive weed in the Northern Virginia area — Violets. Violets are vert difficult to control and require special attention. Regular lawn and weed control applications fall short. October 23, 2018 – This picture shows a wood decaying fungus at the base of an Oak tree. There have been heavy outbreaks of mushrooms around trees and lawns due to the excessive rainfall this year. This fungi was identified as Armillaria Mellea. We are not recommending tree removal at this time, but agree to revisit the property in 6 months to re-evaluate the situation. September 10, 2018 – This picture of Boxwood Blight was taken in Alexandria, VA. I recommended 3 Boxwood Blight treatments and ArborKelp to strengthen the shrub.